Three weeks ago, the following outlook was posted for the U.S. Dollar. For the U.S. Dollar's outlook, one of the biggest fundamental truths that I can state after looking at the U.S. Dollar's chart below is that: "Nothing Goes Up Forever." Can it go higher? "Yeah," right now, fundamentals in the bond markets are fulling the dollar's rise. Technical patterns will always take a backseat to Market Fundamentals and as long as bond yields continue to move up, so will the dollar. So, the outlook for the is simply to expect more of the same until market fundamentals start to set-aside for the dollar. When the dollar was rising in the Outlook chart above, the Ten-Year Treasury Note's yield had moved up to 3.11%, this was a big factor that helped to fuel the dollar's rise in price. However, over the last three weeks, the Ten-Year Note has been falling, it had fallen to a monthly low of 2.76%, but it has since had a bit of a bounce and is now sitting around the 2.96% level. When the Ten-Year Note fell it helped the dollar fall in price and so did the jobs report that was released on 6/1/2018. The jobs report was great in substance, it just gave a signal to the market that told it to expect an interest rate hike soon, which should come in the middle of this week, at the FOMC on 6/13/2018. In the U.S. Dollar's outlook chart below, you can see that there are now two wedges identified. First, the large negative 'Rising Expanding Wedge' has been in its trading chart for more than a month, and now there's a smaller positive 'Falling Expanding Wedge' that has been identified. Well, first off, if the summit between President Trump and North Korea's leader Kim Jong Un goes well on June 12th, then this should help push up the dollar, breaking the positive 'Falling Expanding Wedge' first. However, if it doesn't go well, then we'll most likely see the dollar fall, breaking the negative 'Rising Expanding Wedge' first. A lot is riding on this summit, but beyond that, the Federal Reserve meets on June 12-13th, and because of the jobs report, the FOMC is expected to raise rates another .25% this week, which will also be a negative on the dollar. So, the outcomes of these factors will mostly dictate how the U.S. Dollar moves; meaning, the technical patterns exist, but, fundamentals are having more influence over the dollar's price moves. Two weeks ago, I wrote a blog post for Silver titled: Where's Silver Going? The outlook for silver had three parts, below are the charts and commentaries from that outlook. As mentioned in the introduction, silver now has two technical patterns in its short-term trading chart, and as the 'title graphic' implies one is negative, the other is positive. The first outlook chart looks a lot like last week's outlook chart. Even though the 'Falling Wedge' was broken, last week, it can still be drawn, which means that it is still relevant. 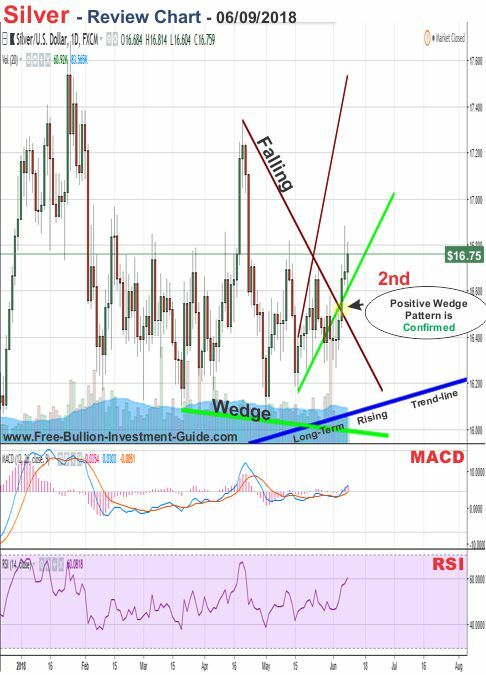 The other pattern that has formed in silver's short-term trading chart is a negative 'Rising Expanding Wedge' pattern. Continue to the next chart, below, to see the full outlook. 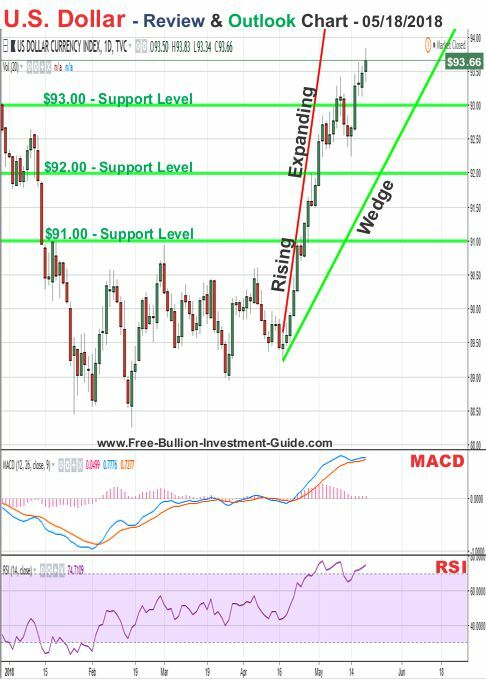 In Silver's final outlook chart below, both of the technical patterns are shown in the chart. For the week to come, we are simply at the whim of the Fundamentals in the news. Yesterday (5/26), we heard that North Korea, South Korea, and U.S. official met to talk about the future of talks and it sounds like that the summit between Kim Jong Un and President Trump may be back on schedule. This is good news for the U.S. Dollar, which may be bad for silver. But, silver isn't only a safe haven, it is also an industrial metal, so it could be a positive or a negative for the precious metal. 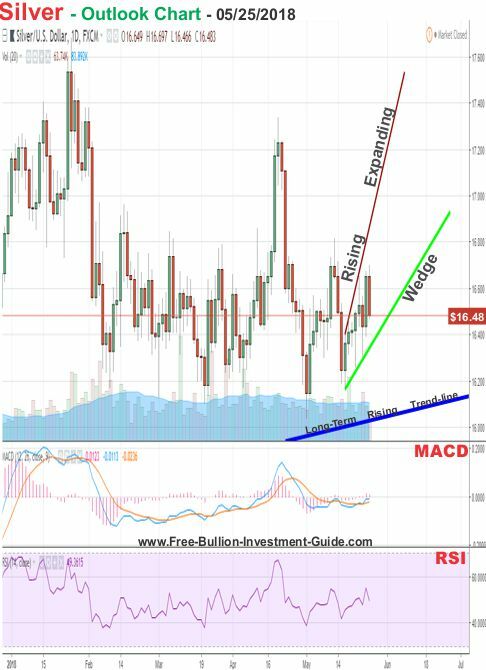 There are other variables at play this week to pay attention to for silver's future market. First, on Thursday (5/31) the U.S. 'Core Inflation' report will be released, and I don't know if you've bought gas or groceries lately but, in case if you haven't, prices are on the rise. Secondly, the U.S. Jobs Report is expected to be released on Friday (6/01), which depending on whether it is bad or good will give market players an idea as to how the Fed will move at its June Meeting (06/12-13/2018). So, with all these fundamental variables in play this week, it's very hard to say how silver will move in the week to come. 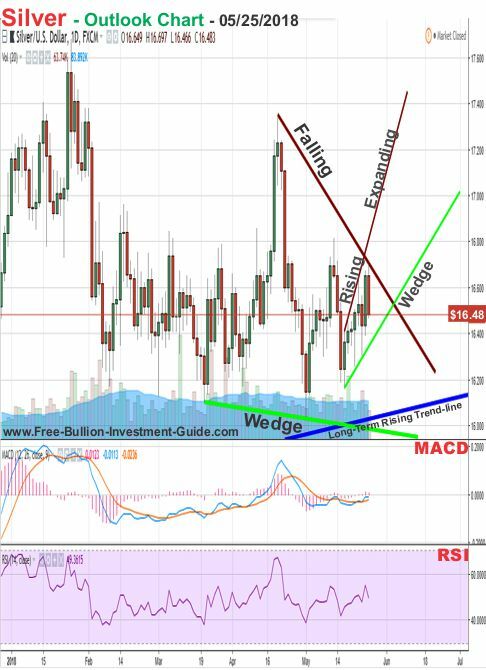 However, if I were just looking at the chart and had no knowledge of what's going on in the World, it looks like silver will break and confirm the negative 'Rising Expanding Wedge' pattern before it breaks and confirms the positive Falling Wedge pattern again, but time will be the ultimate judge of what happens. 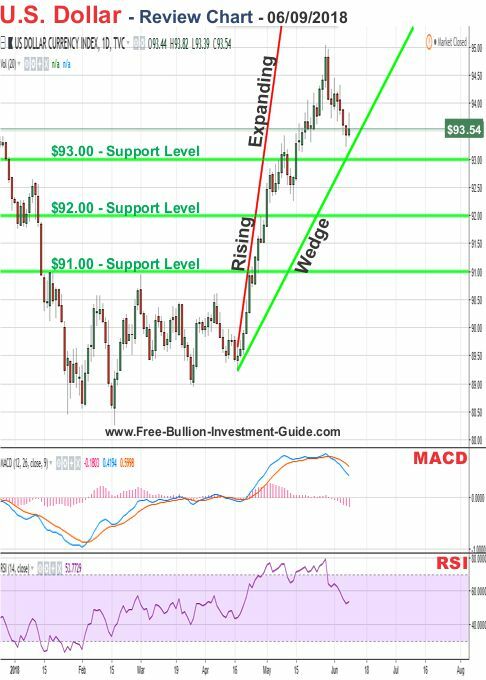 In the next two review charts below, you can see that was stated in the last sentence of the silver outlook from two weeks ago, happened. 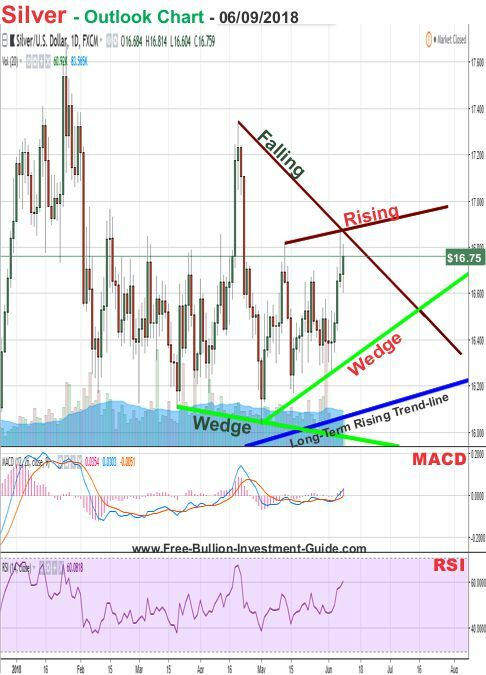 "However, if I were just looking at the chart and had no knowledge of what's going on in the World, it looks like silver will break and confirm the negative 'Rising Expanding Wedge' pattern before it breaks and confirms the positive Falling Wedge pattern again, but time will be the ultimate judge of what happens." In silver's outlook chart below, you can see that two patterns have been identified in silver's charts. 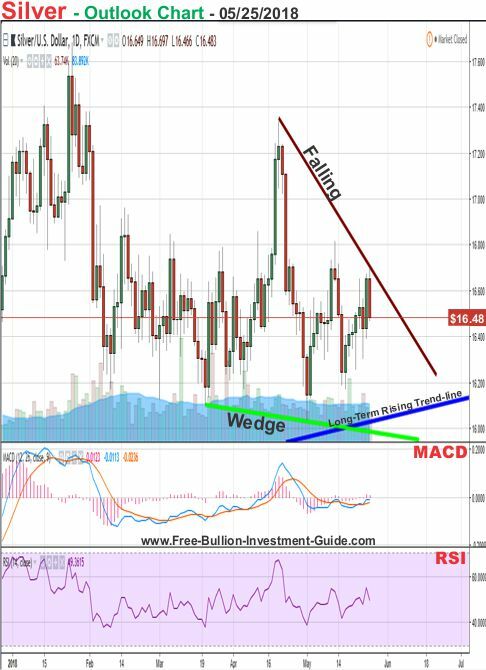 First off, even though the 'Falling Wedge' was confirmed last week, it is still relevant because it can still be drawn in the silver chart. However, it looks like the price of silver is peaking, for now, so we may see silver fall in the early part of this week, at least until the FOMC meeting, and in doing so it may break and confirm the new negative 'Rising Wedge' that was is now in its chart. But, as always, time will tell what happens. 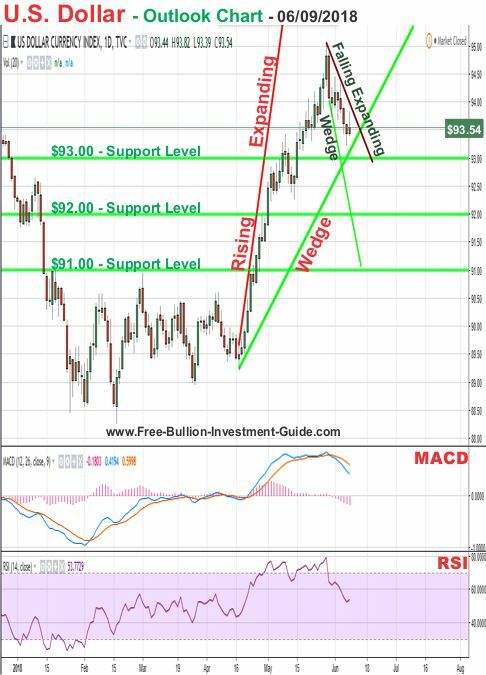 Three weeks ago, the following charts and commentary were posted in gold's outlook. 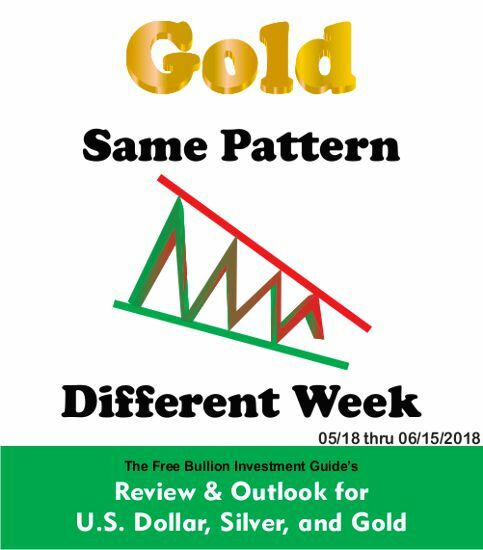 As mentioned in the review above, the positive patterns in gold's chart can still be drawn, and as long as the technical patterns can be drawn, they are still relevant. 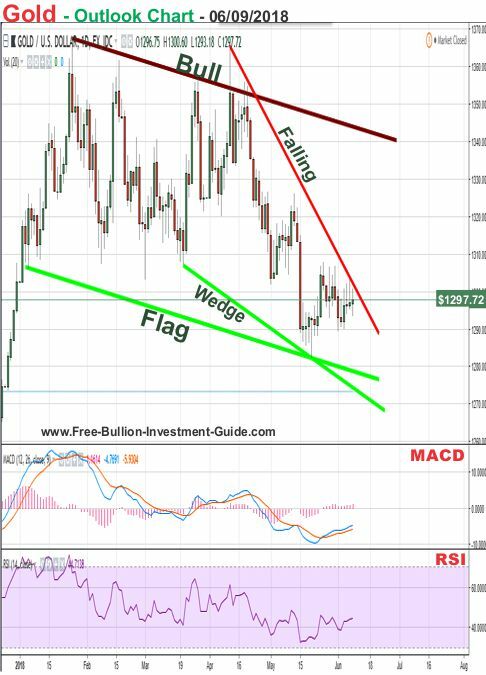 For gold's outlook this week, like silver, gold's future mostly depends on how the U.S. dollar moves, if market fundamentals for the dollar turn negative, then we may see gold move up and confirm the 'Falling Wedge' pattern. Time will ultimately be the judge as to how the precious metals move. 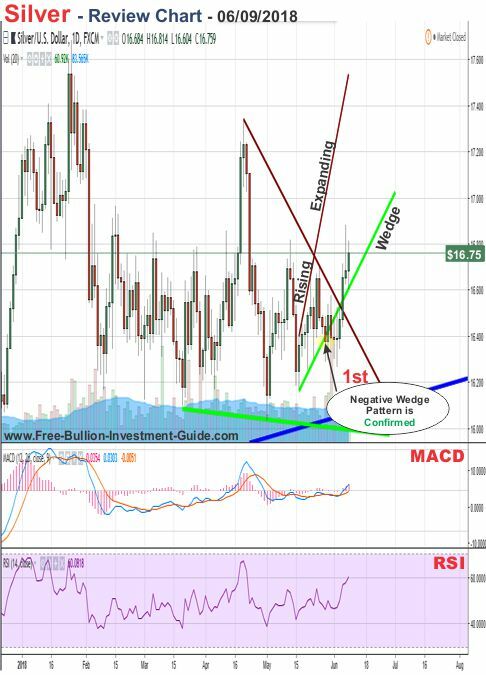 "it will need to be a strong and convincing move up for the price of gold to break above the 'Bull Flag." Perhaps, that strong and convincing move may come when the FOMC moves to increase interest rates as is expected on June 13th, but that's just speculation (on my part), yet it's just one more thing for gold investors to think about, as time moves on. 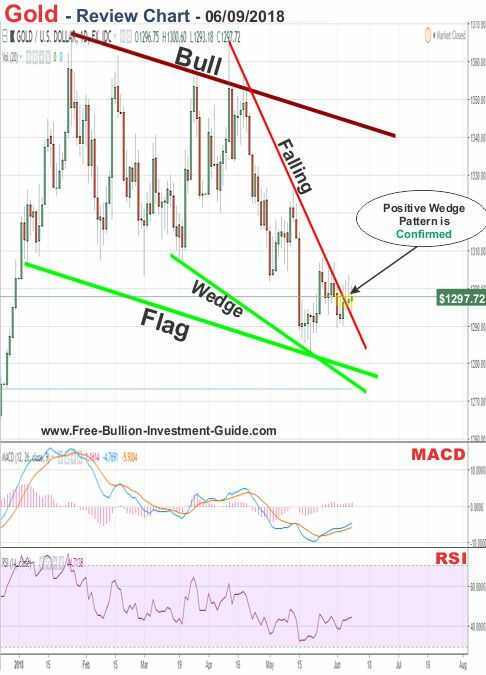 In Gold's review chart below, you can see that the positive 'Falling Wedge' was broken last week, but nothing that was written in the previous outlook was the cause of it. Instead, gold's slight move up in price last week was mostly due to the talking heads in the media about a 'Trade War' between the United States, Canada, and Europe. 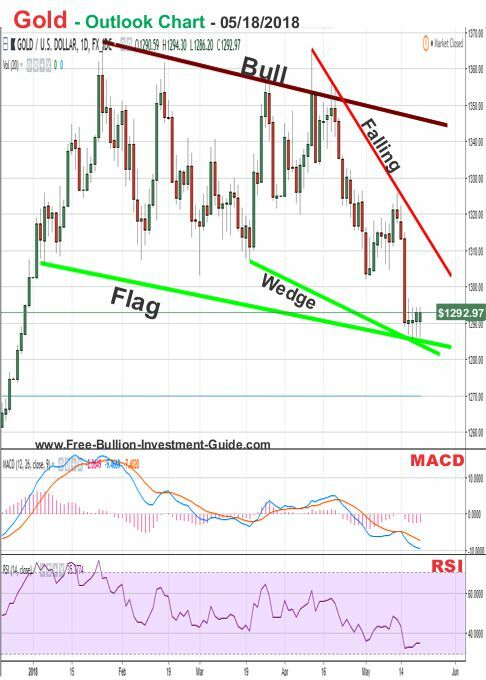 The positive 'Falling Wedge' can still be drawn, so its still relevant, plus the Bull Flag is still in gold's chart, but at the time being it's nowhere near being confirmed. For the week to come, it depends on how well the Summit between President Trump and Kim Jong Un goes and on how the FOMC votes this week on interest rates will have a great influence on how gold moves. Like the U.S. dollar, fundamentals outweigh technical analysis this week, time will tell what happens.